Lower gas prices, rising wages and good jobs reports are putting a smile on the faces of many middle class Americans. Middle class and lower-income Americans are feeling more optimistic these days, a recent consumer confidence survey from the University of Michigan found. These folks now feel they'll see their wages rise in the year ahead, said Richard Curtin, the survey's economist. That's a change from a few months ago, when they expected their incomes to fall. Also, they benefit more than wealthier people from cheaper gas prices -- as well as lower home heating oil and natural gas prices -- because they spend a larger share of their household budget on energy. "The middle class are spending less at the pump. Their job prospects are better. Their wage increases are outpacing consumer price increases," said Chris Christopher, an economist with IHS Global Insight. Wole Rotimi, 30, is feeling more confident these days. The tech analyst received a 5% raise this year and is expecting an even larger one next year since his employer -- a software company -- is doing well. He and his wife bought a home in Bowie, Maryland, last year, and he thinks he already has $70,000 in equity, thanks to rising home values. Plus, lower electric prices and warmer temperatures mean he's only paying up to $210 a month to power and heat his home, compared to as much as $500 last year. Rotimi also feels more secure about the job market. When he lost his job in 2010, it took him months to find a new one. Now, he's confident he could quickly secure another position if he had to. "I feel the economy is booming. We in the middle class have a lot of momentum now," said Rotimi, who has two young sons. "We have money in our pocket. We can feel more confident because we have the income coming in." 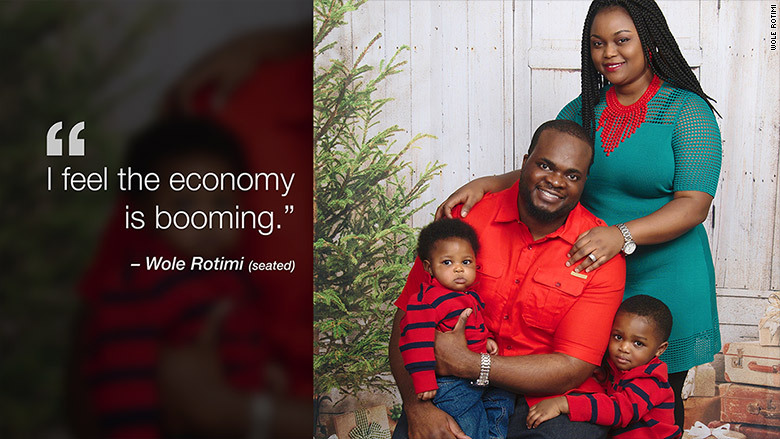 This bubbly feeling means Rotimi and other Americans are spending more. He bought a new SUV this year, took several vacations and is spoiling his boys this Christmas. "You save a few bucks at the pump, you eat out a bit more," Christopher said. The same can't be said for some in the higher income bracket, who earn more than $75,000 a year, according to the Michigan survey. They are more guarded about their future prospects because of recent stock market gyrations and economic troubles in Europe and China, Christopher said. 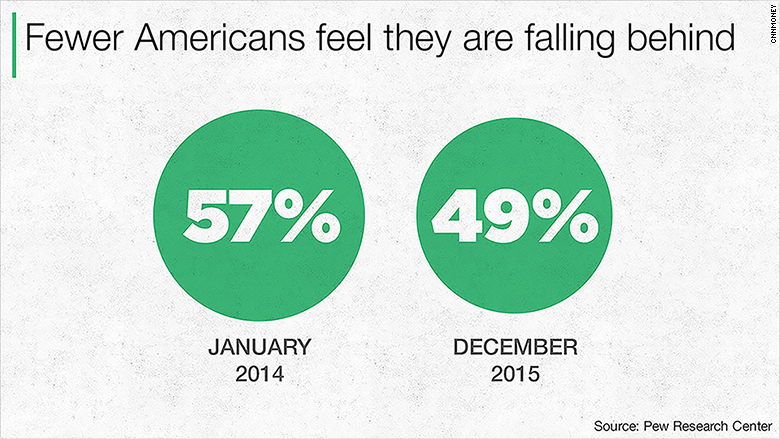 Overall, fewer Americans feel they are falling behind financially now compared to January, according to a recent Pew Research Center survey. While Pew found that Americans are less optimistic about the health of the economy than they were in January, more than 6 in 10 adults expect their financial situations to improve over the next year. Both those making more than $100,000 and less than $30,000 have a rosy personal outlook for the future. Some 41% of those polled said there are plenty of good jobs available in their communities, the most positive response in eight years. Only 33% say there are lots of good jobs to be had locally, but this share is up 7 percentage points since August 2014.